Well they are not alphabetical and I have a lot more favourite cars. In fact, I like nearly all cars from 1940 to 1980. Iv'e always liked classics, especially American Muscle cars. In fact, nearly all my best friends love Muscle Cars, from Mustangs to Cuda's everybody loves Detroit Muscle!. Apart from the Handling, the power, tourque, BHP and everything else about them is great! That's why I'm looking forward to the new Challenger! Some say it looks like a "beached whale", and some even say it resembles "an upside down bathtub". But I say, it looks cool! Although generally considered an "old person's car" I think the Crown Vic looks pretty sharp when painted jet black like this one. 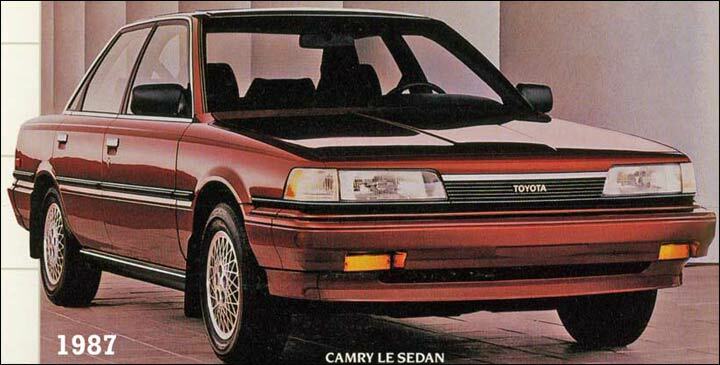 You're probably thinking "Toyota Camry? What car is more boring than that?" And you're right, it probably is one of the most boring cars out there. But I still manage to find beauty in it even though it is ordinary. The ultimate family sedan. Nuff' said. Hey, The '77 Dodge Royal Monaco and the '76 Eldorado are good choices! beautiful bodies with big powerful engines, but the handling isn't too good. Topic digged a little, but.. The '76 "Eldo" was to be the last factory convertible made in the US, and was until Chrysler's K-car offering, which was a New Yorker I think. When Jalopnik was doing their fantasy garage, I found I was rather rabidly opposed to some of their selections, so I tried making up my own 50 car list to see how it compared to theirs. It was very hard, and I only got to 42 before giving up. It still took quite a few hours of going back and fourth through my unlimited fantasy garage (1,203, last time I counted) to come up with that many. If it's only ten or so, that's a lot easier, I can just pick my absolute favorites. With 50 or 100, I find it much more difficult. Even looking through this now, I can see some cars I'm not sure should be there, but I can't think of what to replace them with. Dmitri Parfjenov T-98 Combat Hi.Pro.S. My list, In no order, except the first 2! Right on! You've got some good taste in cars man! Thanks, I thought you would like the caprice and crown vics! Well, now it's my turn to say my favorite 100. These are not in any order. Some day when I am rich I will own every single one of these and open a museum. Of course, I will be free to take any car out and drive it any time I want to. I think my normal daily driver will be the Crown Victoria though. It's hard to name all 100 cars so I guess i'd just want to mention my top 5..
and how can i forget my very dream car.. a red ferrari enzo..
Don't think I will get 100 but I'll start to list. In no particular order. Could do a lot more and might add to it but I must go to bed. Here goes my list. The red ones are the models I already own (2 out of 100, not bad ). I accept donations to make this possible. Thank you!